My highlight of Tuesday’s women’s quarter-finals will see the five-time Wimbledon champion and number ten seed, Venus Williams take on the 2017 French Open champion and number 13 seed, Jelena Ostapenko. Williams will be attempting to snap Ostapenko’s 11 match winning streak in Slams. The pair will be playing each other for the first time on the WTA tour. Williams enjoyed her quickest match of the week, needing just 68 minutes to defeat Ana Konjuh, 6-3 6-2. This was Konjuh’s first match on Centre Court, and definitely not her last, but experience prevailed on Monday. Williams hadn’t actually played on Centre Court yet this tournament (joke) but it was almost a surprise that this particular match got chosen considering the calibre of matches on Manic Monday’s schedule. The American won 12 of the last 13 points in the first set, breaking at 4-3, to win the opening set, 6-3. Williams faced just two break points in the match, saving both when leading at *2-1 in the second set. Williams landed 72% of first serves in, winning 86% of first serve points and 57% of second serve points. It was a fine display from Williams, who had arrived in the tournament with a lot going on behind the scenes. On the court, Venus has been extremely focused and is still in the mix. With her first singles win on Centre Court in 6 years, Venus is into her second straight #Wimbledon quarterfinal, beating Konjuh 6-3, 6-2. Ostapenko held on in a nervy finish to eventually see off Svitolina on her eighth match point. It was another brutal display of hitting from Ostapenko who hit 42 winners during the match. Her forehand was lethal early on with Svitolina not doing enough to stay away from that wing. The number four seed managed to get one of the breaks back and threatened the second one too. Ostapenko held on, saving three break points at *4-3, and then broke to win the first set. Both players were struggling on second serves – in particular, Svitolina who landed just 45% of first serves in. Ostapenko came through another tight game on her serve in the second set, saving five break points to hold to 3-2 (sealed with a huge roar!) and then rode the momentum to get within one game of the win. Ostapenko wobbled serving for the match although credit to Svitolina who began to change up the rhythm, throw in some different-paced balls and generally play a bit better. Ostapenko missed one match point on Svitolina’s serve at 5-2* and then four more serving for the match at *5-3. Svitolina even had a chance to serve for the set with her fourth straight game. Ostapenko though broke back to force the tiebreak. Ostapenko hit an array of winners in the tiebreak including a forehand winner when she was moving backwards and a gorgeous short-angled backhand winner. It was the backhand that was on fire towards the end of the match. Ostapenko missed two more match points in the tiebreak, including one on an extended rally where she eventually went wide with Svitolina scrapping superbly. Ostapenko sealed her place in the quarter-finals of Wimbledon for the first time in her career on the eighth match point. 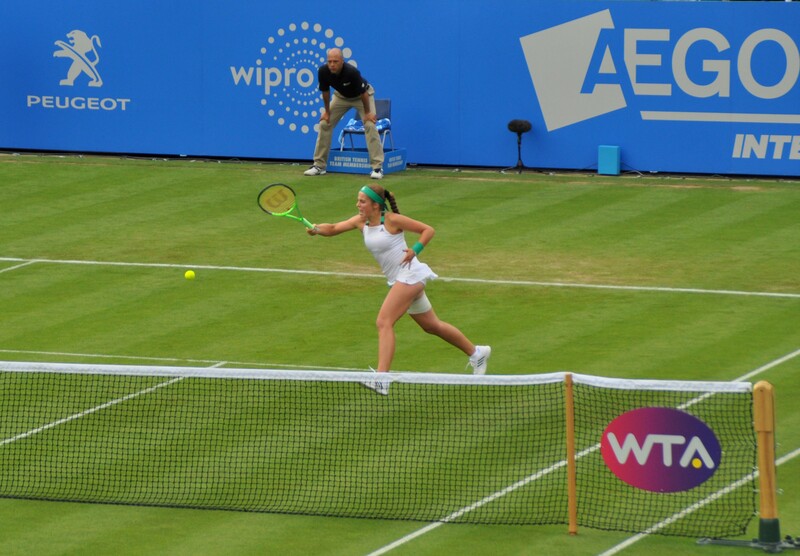 There were nerves at the end, but Ostapenko’s aggression got her across the finish line as she managed to finish the match with a positive winners to unforced errors differential of +3 (42 to 39). Final thoughts: Williams is making her way through the entire collection of WTA up-and-comers this tournament having played Elise Mertens, Naomi Osaka and Ana Konjuh! Ostapenko brings a new dimension with the huge amount of confidence she currently possesses from winning the French Open. It’s still going to be a new experience for Ostapenko playing out on Centre Court in a Wimbledon quarter-final. Her bold sense of fearlessness since winning Roland Garros has been so impressive to witness. Williams has had a couple of testing matches, but has never looked in real danger. Ultimately her experience has prevailed with the serve looking very impressive up till now – she has landed 66% of first serves in and won 81% of points behind the first serve. Considering her serve has laboured at times over the past few years, it’s an encouraging sign about how she is feeling physically. Williams did a good job at absorbing pace from Konjuh and not panicking. While Ostapenko brings a very real threat in this match, i’d favour Williams to weather the storm. Can’t wait for this match! I’m tentatively going for Jelena Ostapenko to win this. She is full of confidence and enjoying her newfound fame and I do not think that she will be too overawed by playing on CC and she will relish the experience and has youth on her side. I did not see the Venus/Konjuh match but I was not that impressed with Venus when I saw her wins against Wang Qiang and Osaka and I think that she would have lost if their opponents had more experience. However Venus is never a player to underestimate. Likely to be played under the roof and should be an entertaining match and could be really good if Osapenko plays as well as she has so far at Wimbledon. I really wished u watched the Venus vs Konjuh match. Total master class from Venus , she doesn’t even need to raise her level for this match cuz if she plays the same as today there will be little ostapenko can do. Go Venus go! Go Coco go! Venus and Coco are on fire. Alona Ostapenko says don’t call me Jelena anymore, and she was looking right at The Moo when she said that. I saw this and was wondering whether I should start writing Alona! Venus Williams …. schooling all the newbies, one match at a time. Hats off!